Need something to jazz up those baby kale leaves? Magical green sauce. Something to drizzle over crispy chicken or make your tacos pop? Magical green sauce. Got a millet + quinoa combo that needs fresh sauce to bring it all together? How about a marinade? Try this magical green sauce recipe. You know, because it’s MAGICAL. If you follow along on Instagram or Facebook, you might have heard me mention magical green sauce. Using a 1-quart Ball jar and an immersion blender, I make it several times a week. It’s got all the elements of a dressing – tangy, herbaceous, luscious and creamy with just the right amount of salty sweet from coconut aminos. It’s also easy. More than once, I have made this sauce while bouncing a clingy toddler on my hip. Other times my 6-year-old and toddler take turns holding the immersion blender while I press the button. 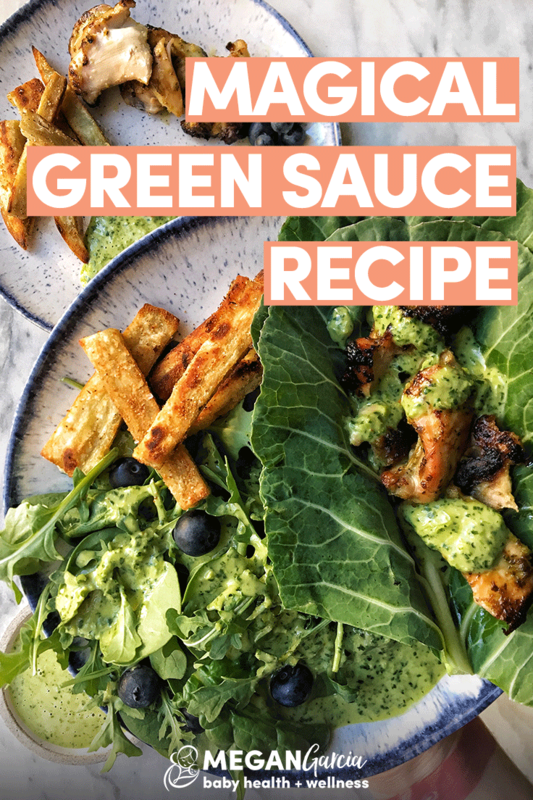 Besides all the ways you can use it, the real magic of this sauce is that it gets some pretty fabulous nutrients in your daily eats. And by nutrients, I mean the quercitin that’s found in cilantro leaves along with macronutrients, micronutrients, and antioxidants that are naturally abundant in spirulina. Granted, this recipe only calls for 1/2 teaspoon of spirulina. Add a full teaspoon, if you’re feeling the magic. When it comes to all the pigments and antioxidants in plant foods, I like to get them in whenever and wherever possible. Even in tiny amounts. Stack your nutrients this way, and they add up. In the world of baby nutrition, there’s a lot of support for spirulina. It’s not just an ultra trendy superfood. It’s exceptionally high in quality protein and iron, along with other minerals like zinc, magnesium, and potassium. It offers a small amount of omega-6 in the form of GLA (excellent for inflammatory skin troubles like eczema) and brain-building omega-3 fatty acids, DHA and EPA. In some regions where meat is scarce or hard to come by, spirulina can save lives and protect against malnutrition. And for folks with a history of allergies or eczema, spirulina inhibits the activation of mast cells. This makes it a very good food to offer a baby who has signs of histamine overload. If you’re wondering about other ways to fit spirulina into your life, you can add it to smoothies or dust your liar balls with it. Clean the cilantro. I usually twist and tear the leaves from the base of the bundle and submerge in filtered water (Berkey, holla!) and give them a shake before drying in a tea towel. Trim the ends and the tops off of green onion, make sure it’s free of dirt. Use a quart-sized glass canning jar and locate the side that reads in ml. Begin measuring out the liquid ingredients: coconut aminos, apple cider vinegar, and olive oil until you reach 350 ml. Spoon coconut butter into the jar until it reaches 400 ml, about 2 large tablespoons. Add fresh herbs and green onion. Add spirulina. Blend everything with an immersion blender. Store in the refrigerator for up to a week. When cold, magical green sauce has the texture of a thick paste and will return to a thick runny sauce once it reaches room temperature. Yields: About 500 ml or 2 1/4 cups of magical green sauce. * Use whatever green things you like best. I often add a bundle of mint leaves to this recipe and it’s delicious!